If not of actual brick and mortar from the vanished footprint of Berkeley Square, a remnant of the street does exist in the form of a century-old school now 20 minutes by freeway (at 2 a.m., at least) from its original location just outside the east gates of the Square. Berkeley Hall School was founded by Christian Scientist sisters Mabel and Leila Cooper in 1911 at 2250 South Western Avenue as a boarding and day school for daughters of the West Adams gentry, taking its name from the Square; the sisters had been teaching at the Westlake School for Girls, then at Sixth and Alvarado overlooking its namesake park. 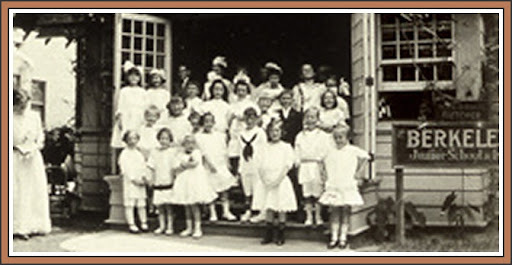 According to Tracy Cheney, who teaches art at Berkeley Hall today, some parents who had daughters at Westlake were impressed enough with the new methods of instruction espoused by Mabel and Leila that they urged the sisters to establish their own school. According to display ads in the Los Angeles Times soliciting students for the resulting venture's 1911-1912 school year, music, dancing, and French were offered, as well as classes in German "open to those not regularly enrolled." Boys under 10 were admitted as day students; a summer mountain camp was offered. By 1915, Berkeley Hall had moved nearby to the home of Eugene Weston at 2211 Fourth Avenue. 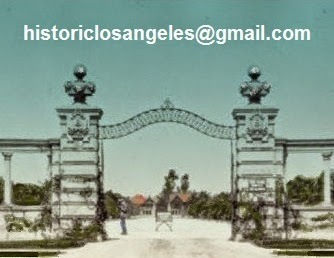 By 1920, the school had evolved into a coed day school with classes from kindergarten through the sixth grade, offering "auto service to all points of the city and Hollywood"--this last feature necessitated by the beginning dispersal of the pool of private-school students to neighborhoods far afield from West Adams. 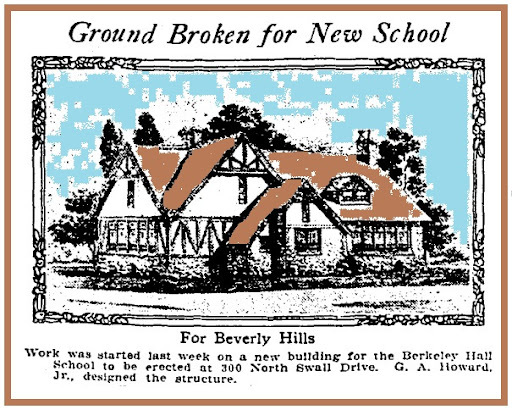 In 1925, Berkeley Hall embarked on an ambitious expansion, buying five acres in Beverly Hills and becoming an early adapter to the trend of residential fashion moving to the emerging modern-day Westside of Los Angeles. The first of its buildings on North Swall Drive were ready for the 1925-1926 school year. By this time, seventh, eight, and ninth grades had been added, with a high school being planned--the current form of the school was being set. After 55 years in Beverly Hills, Berkeley Hall moved to its current 66-acre campus on Mulholland Drive just west of the 405 freeway. Almost exclusively a stronghold of Christian Science in terms of faculty and students until 1989, Berkeley Hall was to again adapt itself to social change, including to the reality of the evolution of Mrs. Eddy's church, and continues to thrive with a diverse student body numbering 250.